Two new cosmetic injections will be considered for approval by an FDA panel on Friday, paving the way for a new generation of skin-smoothing procedures. The Early Show medical correspondent Dr. Emily Senay explains the new products are called Restylane and Hylaform, and both are forms of hyaluronic acid, a sugar which retains water and occurs naturally in the skin, but declines in quantity as the body ages, resulting in wrinkles. Both products have been used in other countries for years as cosmetic fillers. They are injected under the skin to fill out wrinkles in basically the same way as collagen. If recommended for approval today, they could soon become another option alongside collagen and Botox and other cosmetic injections. Senay says if the cosmetic injections are approved, they could eventually be available in different formulations for use on different sizes of wrinkles. The new injections work differently compared to Botox. The Botox gets rid of wrinkles by relaxing the muscles that contract and crease the skin. Restylane and Hylaform are used to fill out deeper wrinkles that cannot be smoothed out by Botox. Most collagen procedures have used an animal substance. Restylane is a natural product that many doctors believe will make it a more desirable choice. And, Senay explains, collagen injections only last from three to six months. Restylane lasts from six to nine months, and it also has less risk of allergic reactions than other injections. Senay says using Restylane means a more natural product without the need for as many repeat procedures to maintain the effects. Time and further study will likely reveal the pros and cons of the different methods. Minimally invasive cosmetic injections are hugely popular in the United States. The latest statistics show that Botox is currently the most popular cosmetic procedure. 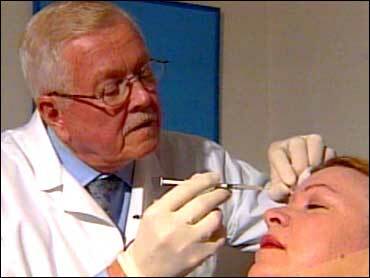 More than 1.5 million Botox procedures were done in 2002. Collagen injections accounted for three-quarters of a million procedures. The most likely scenario for the future is using the different techniques for different parts of the face. Senay says Restylane and Hylaform Aremore are suited for use below the nose for deeper wrinkles, and Botox is suited for smoothing out the finer wrinkles around the eyes. Many say the two new injections could be made available to the public by end of the year. The prices have not been set, but they are expected to be priced competitively with Botox and collagen. The exact cost will vary from patient to patient depending on the individual.